If you are already literate in Chinese, which font you use to display characters on screen isn’t very important, but for second language learners, it can be very confusing if you use the wrong font (or if someone else is using the wrong font). This is especially true if you’re going to handwrite characters you read from screen (including from most dictionaries). In this article, I’ll help you make sure you’re using the right font. 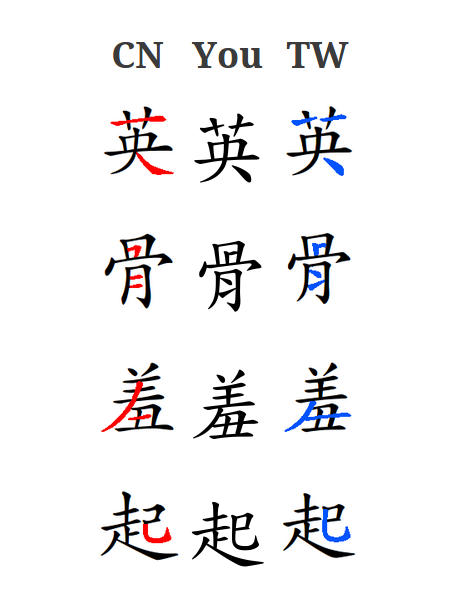 Both the fonts I have selected are 楷体/楷體, which is suitable if you’re learning to read and write characters. To allow for comparison, the references are images, not text, so they will look the same regardless what settings you have. If you have the fonts mentioned above configured properly, you should get the middle column matching the either the on the left or right. Font-handling for Chinese characters is really hard to get right and some browsers won’t even allow you to set specific Chinese fonts, in which case the above test will fail unless you select one of the fonts I listed as your default font for all text, which is probably a bad idea. The above set-up works on my system (Chrome on Ubuntu), but don’t panic if it doesn’t work on yours! Now, unless you use exactly the fonts I recommended, you probably won’t get a 100% match. However, you can still see if the coloured parts match or not. Many fonts will give you mixed results. For example, one of the open source traditional fonts I use a lot (AR PL UKai TW), gives correct Taiwan standard for most characters, but not for 雪, 聚 and 窗. That’s also a font I use here on Hacking Chinese, but you probably won’t see it unless you happen to have it installed already. I have not included characters that have the same or very similar differences as those described or covered elsewhere in this article. If you know of more, please let me know! As I said in the introduction, font differences are mainly important if you use your computer to learn how to write characters by hand, such as by using flashcards or printing text for writing practice. In other words, if you’re only reading, it doesn’t really matter. Most literate people would probably not even notice most of these differences when reading, but they are quite easy to spot if you look for them. 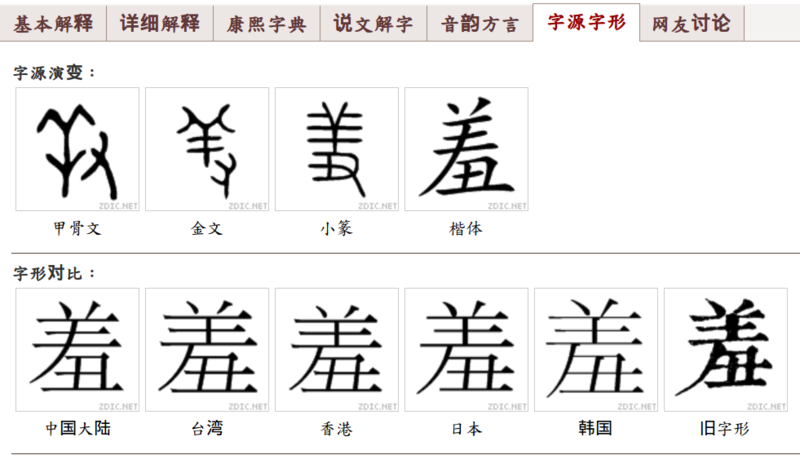 In any case, when you use programs, websites or apps to learn Chinese, you should be aware of what font is being used. This is very hard or impossible to control in some situations, especially on mobile phones, but some apps allow you to select fonts (Pleco and Anki, for example). Choose fonts that match the standard you want to follow. In general, Zdic.net is a great choice. It offers animated characters (Mainland standard), but if you click 字源字形, it will show you character versions for different regions (check the screen dump on the right), including Mainland China, Taiwan, Hong Kong, Japan and Korea. For students who want to adhere to the Taiwanese standard, please refer to the Ministry of Education dictionary, which is a great tool in general, but in particular offers animated characters. You can also find a variant character dictionary here, but that might be a bit much for the average learner. As I have noted in a previous article, fixing the font isn’t always enough. There are character variations that look very similar, but that have different code points, meaning that changing font will not help. To fix this, you need to convert characters. I haven’t done proper research into different conversion tools, but this tool could handle all these cases except 录/彔. Please make sure you select the correct source. Operating systems and devices change rapidly and there are so many different combinations that it would be foolish to try to collect information about how to install fonts here. Instead, just search for your device and operating system, plus “how to install fonts” and you should be on your way! I hope this article has provided you with more practical help when it comes to font issues when learning Chinese. It’s not easy to wrap your head around how fonts actually work on computers, phones and devices, but I have done my best to get you moving in the right direction. Good luck! Yeah, this is one of the most annoying problems when starting to learn Chinese since every single stroke (especially stroke length) could be significant, although most are not. I think there’s no way to really solve this problem except trying to stick to one reference font whenever you can (for flashcards, for instance). > 1 Copy one of the two pictures below. My editor is vim btw. I downloaded the image but it was a regular png that shows binary in vim..
On most normal computers, you can just drag the image from the article into an open text document. You could also just save the picture locally and then open it from within your text editor. I think all regular text editors should be able to open .png files! I am pretty sure you mean “word processor”, like Microsoft Word, Open Office, Libre Office, Google Docs, etc. A text editor, like Notepad, TextEdit, vim, gEdit, only displays text (which usually is garbage if the file is binary). As a programmer, it’s confusing to imagine opening a binary file (which is what a .png is) in a text editor. To the lay person though, I can see how they’d mix up the terminology. Yes, I mean word processor; thanks for pointing this out!